Insect traces appearing on the front parts of the auto body by long driving during the warm season are very difficult to remove by standard detergents used by touch-free or hand washing. It is important to know that insect traces need to be removed immediately after a drive, otherwise the paint coating will be seriously damaged. Insects contain acids harmful for lacquer, paint, as well as for plastic and chromium-plated parts of the auto body. Old insect traces on the bumper, hood and the car in general cannot be fully removed even by applying expensive chemicals. Such contaminations can be eliminated only by abrasive polishing of the auto body when the damaged surface layer is removed. 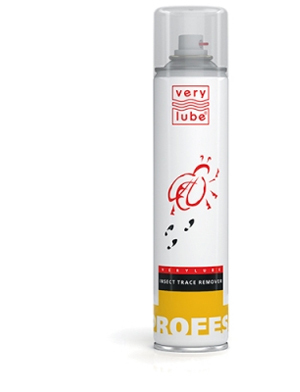 This problem can be easily solved with the help of concentrated VERYLUBE Insect trace remover. A package of VERYLUBE Insect trace remover (20 ml) is added into the washer tank for efficient removal of insect traces on the windshield. Usually washers propose to clean insect traces at extra cost. 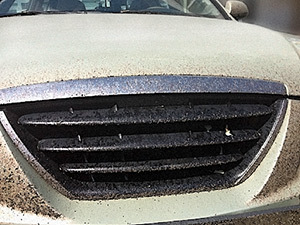 That is why you should treat contaminated spots with an insect trace remover before going for a car wash. This way you can kill two birds with one stone: quickly eliminate insect traces and avoid extra expenses.